Can I have this fun, wacky, sound-shaping Arturia monosynth and the new Moog Minitaur, please? 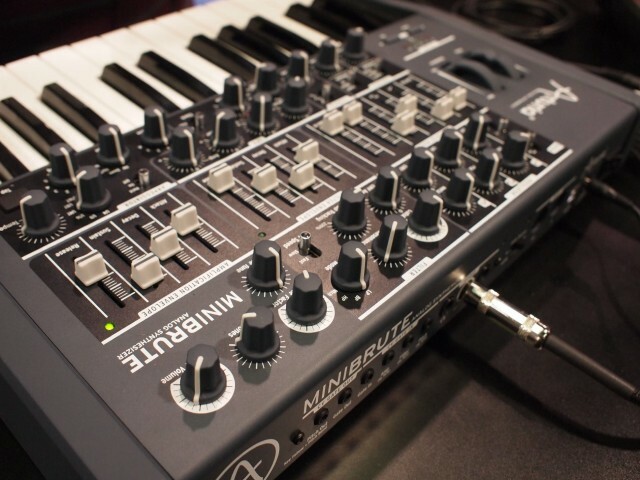 Actually, at their prices, you really could – and still spend less than the cost of a lot of standalone synths. There’s lots of new stuff for musicians. Sometimes, the best thing to do is to leave some of it out, and skip to what’s really interesting. Neil Bufkin did a great job last year covering NAMM for CDM, shooting some lo-fi, informal videos that got right to the heart of what we wanted to know. So, I’m pleased to share Neil’s work again, since unless you’re following forums (fora?) closely, you might miss it. He picked out some of our absolute favorites. Highlights: Moog sums up the Minitaur in one, excellent word (“knobby”! ), the Arturia shows off its sound shapers, Teenage Engineering flaunt their DIY prowess (hint: you can make your own inputs for next-to-nothing for the OpLab), and we get some up-close highlights of other hardware, too. Bonus: I’ve included a quick upload from my, cough, phone of the QuNeo hardware. We’ll wait to shoot prettier videos when this gear actually ships. In the meantime, find a really old CRT (maybe from an old Commodore) and plug into that, if you can. I didn’t get to shoot a video, because I was too busy for the few minutes I had with the Minitaur just playing. The controls are simple, elegant, and – here’s why you know it’s a Moog – absolutely every conceivable position of the parameters sounds brilliant. It’s a bit spooky, or unfair, or something. I’ll have a full hands-on hopefully around April from Berlin. Here’s a tour with the Chief Engineer of Moog. Moog also posted some celeb visitors to their booth jamming away and making this thing sound even better; see other tidbits from their Twitter stream. It has a name that sounds Moog-like, and it might be an analog hardware synth, but make no mistake: this synth is all-French, and un-Moog. The feel of playing it different, it has a great rotary-controlled arpeggiator, and the sound shapers and oscillator mix controls can take it into some very different sonic territory. I made repeat visits to the booth just to wrap my head around the feel, and got to really love it. So now that you’re looking for a keyboard with MIDI and CV to go with all these new sound modules, here’s a surprising candidate – Akai. Yes, we’re utterly relieved to see the company that was recently making tiny keyboards for iPhones and things with only USB MIDI on them return to MIDI DIN and CV. In my hands-on with the MAX49, I was very impressed by the feel. The keybed feels terrific and just springy enough, and the pads are more traditional MPC-style pads shared on the new MPC controllers. They’ve also sorted the velocity response. (That is, they aren’t the pads readers were complaining about on previous Akai keyboards.) Also, the red color that looks so garish in the product photos looks very nice in person; it’s a high-gloss, thick finish that is reminiscent of car paint. It’s likely spendier than what at least some readers will want – especially with the iPad as an everyman’s alternative – but I really enjoy Neil’s detailed look with Smithson Martin at the custom control layouts on the Emulator hardware. While some may resent the gloss of marketing around their work, the truth is, the Teenage Engineers are also doing some great engineering. The OP-1 updates take a synth that was conceptually interesting and make it more musically inspiring and productive, finally starting to realize some of its original potential. And then there’s Oplab. At $300, it’s not an Arduino – but what it is is a unique, programmable combination of CV, MIDI, and USB hosting (that’s the key) to which you can connect virtually any hardware or custom sensor or hardware creation. Some onlooked misunderstood what it was initially, comparing its pricing to boxes that only to CV-to-MIDI conversion, and missing the advantages of USB hosting. Here’s a better look at what it actually does, and I can guarantee, having talked to the TE crew, that there will be more details to come. I hope that this will also inspire other DIY projects, even those not involving the Oplab per se, so we’ll document those aspects, too. Again, The Verge gives us a second look with a nicer camera. Livid has been very, very busy of late. And their latest controller, in collaboration with Richie Hawtin and M-nus, is an extraordinary example of what iteration can do for hardware. The first pad-and-fader-and-knob controllers from Livid were very, very good. This is even better. Quietly, Livid is making the kind of all-around controller many musicians will appreciate, even as big makers struggle to find the formula artists want. Since I hear there’s some association between M-nus, techno, and Berlin, let’s hope we can get a closer hands-on. Anyone interested in that? Show of hands? We have more photos and hands-on details of new tech from NAMM to bring you. I’m working through them slowly, as is my speed, so we can go into the stuff we really care about in greater detail. And since I can’t only look at new gear, new music coverage coming, as well. Be seeing you.